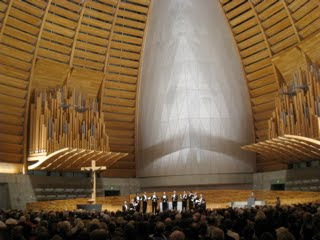 Last night I had the absolute pleasure of attending the barely one-year-old Cathedral of Christ the Light right on Lake Merritt in Oakland for an evening with the Bay Area’s own "orchestra of voices" Chanticleer. The twelve guys are back from touring the country and have already begun their annual Bay Area Christmas concerts. This is the first time I’ve seen Chanticleer, and what I really love about them (other than their music) is the air of the fun they have. There are jokes in the program bios and smiles all around. I spotted the signature insanely awesome handlebar mustache of eldest member Eric Alatorre and the faux mohawk of soprano Michael McNeil. I see this kind of artistic seriousness coupled with gleeful enjoyment a signature Bay Area attitude and I am reminded how much I love living in this part of the country. I am also proud that these guys (most of them from middle America) represent my little slice of the world when they go out on the road.